Northern Ireland actor James Nesbitt has been nominated for a Golden Globe award. Nesbitt has been placed in the category for best actor in a mini-series or film made for TV for his role as the troubled character Dr Jekyll. Among other Irish stars nominated was Wicklow resident Daniel Day Lewis for best actor for There Will Be Blood. Cork man Jonathan Rhys Meyers is nominated for best actor in a TV series for his portrayal of Henry VIII. Carlow teenager Saoirse Ronan, 13, has tough competition from Cate Blanchett and Julia Roberts in the best supporting actress category for her role in Atonement. 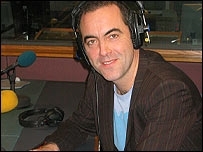 James Nesbitt said he would be attending the ceremony in Hollywood next month "unless Coleraine are playing Larne". Chatting to BBC TalkBack David Dunseith about his nomination, he said: "I'm thrilled, I enjoyed the show, it was real craic." Commenting on his own nomination and the premiere of Closing the Ring, he said Northern Ireland is the up and coming location in the industry. "The accessibilty for film makers here is extraordinary, you wouldn't find it anywhere else in the world," he said. You can hear the interview in full on BBC Radio Ulster's Talkback programme on 28 December at 1200 GMT.